Attorney General William Barr Launches Look Into Early Stage Of Russia Probe The attorney general has launched an informal look at how and why the decisions were made about the early Russia investigation and by whom. It augurs another new phase of the Russia saga. Attorney General William Barr arrives to testify before a panel of the Senate Appropriations Committee Wednesday. But the attorney general did say he has taken seriously some of the criticisms by Republican supporters of President Trump about the way the FBI and Justice Department conducted the investigation. "I feel an obligation to make sure government power is not abused," Barr said. "I think that is one of the principal roles of the attorney general." Alleged abuse of power and alleged bias by the FBI and DOJ have been long-standing themes of Trump and allies since special counsel Robert Mueller was commissioned to investigate whether Trump's campaign colluded with the Russian interference in the 2016 presidential election. The special counsel's office did not establish that, Barr has said, nor did it establish that Trump broke the law in trying to frustrate the investigation. The basis for those conclusions is not yet public, but Barr said Congress and Americans will be able to read much of Mueller's report for themselves when it's released next week. Barr's office is working with Mueller's team to redact it. Trump and Republicans have sought to exploit the tailwind they feel they got last month from Barr's summary about Mueller's findings. The attorney general's testimony on Wednesday confirmed they have an ally at the Justice Department who may help with reviving questions about investigators' practices now that the worst political peril from Mueller apparently has passed. Past subcontroversies about the Russia investigation have involved the FBI's use of confidential informants to approach people in contact with Russians in 2016; questions about what briefings were made to Trump or people in his circle; and investigators' use of surveillance powers. 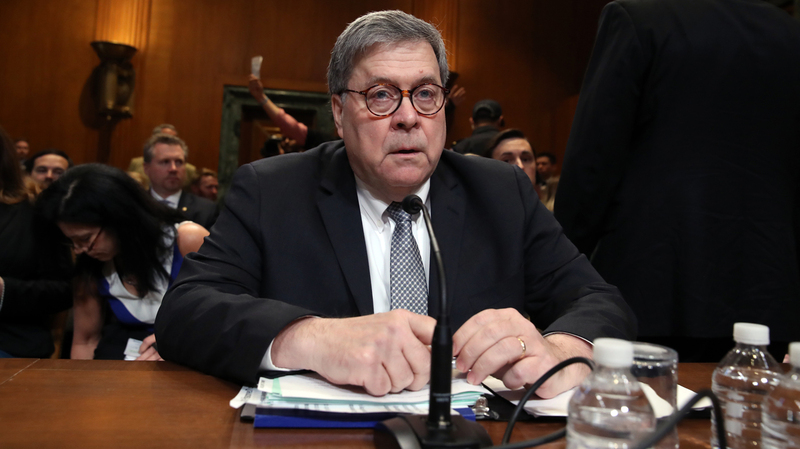 Barr told Sen. Jeanne Shaheen, D-N.H., for example, that "spying did occur" on the 2016 Trump campaign — the question he wants to answer now is whether it was "adequately predicated." Barr later clarified to Sen. Jack Reed, D-R.I., that he has no "specific evidence" about abuse of power or improper surveillance. What he has, he said, are "questions about it. ... I have concerns about various aspects of it." Why, for example, wasn't Trump briefed explicitly about the contacts his staffers were making with Russians at the time the FBI became concerned enough about it to open its counterintelligence investigation? Sen. Lindsey Graham, R-S.C., described a case in which counterintelligence officials became worried that a man working for Sen. Dianne Feinstein, D-Calif., might have problematic ties to the Chinese government. Feinstein was briefed and the man was fired, Graham said. Why weren't Trump or his team briefed in that same way? "That is one question I have," Barr said. "Normally the campaign would have been advised of this. I'm interested in getting that answer." Trump's campaign even included two former United States attorneys, Barr said — Chris Christie and Rudy Giuliani — people familiar with law enforcement and well known to the Justice Department. The attorney general said he wants to find out what notifications were made to the team and why. In the summer of 2016 when some briefings reportedly happened, the FBI's investigation — which began in late July — might have been only a few weeks or even days old and might have been too closely held to have been the subject of one of these briefings. Sen. John Kennedy, R-La., praised the FBI as an entity but said he thought it has become clear that a few bad individuals had made highly consequential decisions in deploying it against Trump and his camp. Kennedy also said it has become obvious how disappointed Trump's opponents are in Barr's summary of Mueller's report, as evidenced by their new focus on the report itself and some expectation that it could still damage the president. The country must move on, he argued. "You're only young once, but you can always be immature," he said. Democrats were infuriated by what they called the return of suggestions about snooping or abuse of power that already have been put to rest in earlier phases of the Russia imbroglio. "I don't trust Barr, I trust Mueller," House Speaker Nancy Pelosi, D-Calif., told The Associated Press in an interview on Wednesday. The attorney general has a duty to be independent, Pelosi said, not serve as a political operative working on behalf of the president. "How very, very dismaying and disappointing that the chief law enforcement officer of our country is going off the rails yesterday and today," Pelosi said at a press conference. "He is the attorney general of the United States of America, not the attorney general of Donald Trump." Sen. Mark Warner, who does not sit on the appropriations subcommittee before which Barr appeared on Wednesday but is vice chair of the Senate intelligence committee, responded on Twitter to what he called Barr's irresponsible airing of conspiracy theories. Russia really did attack the 2016 presidential election, Warner pointed out, and that obviously merited a serious investigation then and today. "Giving a wink and a nod to this long-debunked 'spying' conspiracy theory is irresponsible," the Virginia Democrat also wrote. Trump and his allies have focused much of their criticism of the FBI and DOJ on the warrant that authorities sought in 2016 to conduct surveillance on a junior campaign foreign policy aide, Carter Page. At least some of the information that underpinned the request came from a former British intelligence officer, Christopher Steele, who also was the author of the infamous Russia dossier. Steele's work ultimately was underwritten by Democrats, and because the dossier remains unverified — and, in some cases, its contents have been debunked — critics charge that Page's rights were violated. What has never been clear is what — apart from the material in the dossier about Page — investigators might have uncovered. That may be covered in the Mueller report. Speaking to a House appropriations subcommittee, Barr also said on Tuesday that the use of surveillance would be the subject of a report this summer by DOJ Inspector General Michael Horowitz. Page has not been charged with any crime and has maintained all along that he did nothing wrong. Three other Trump aides who were the subject of investigation by the FBI in the early stage of the investigation — national security adviser Michael Flynn; campaign chairman Paul Manafort; and another junior foreign policy aide, George Papadopoulos — all faced criminal charges, although none were accused of conspiring with the Russian interference. Trump's opponents asked Barr whether he had any evidence about inappropriate steps taken by the FBI or the Justice Department — no, the attorney general said, just some of the unanswered questions posed at the hearing. The attorney general didn't address that directly, nor did he offer any details about how he had reached the conclusions he summarized for Congress in his letters last month. "Once the report is out I'm happy to discuss the process," Barr said. NPR reporter Susan Davis contributed to this report.